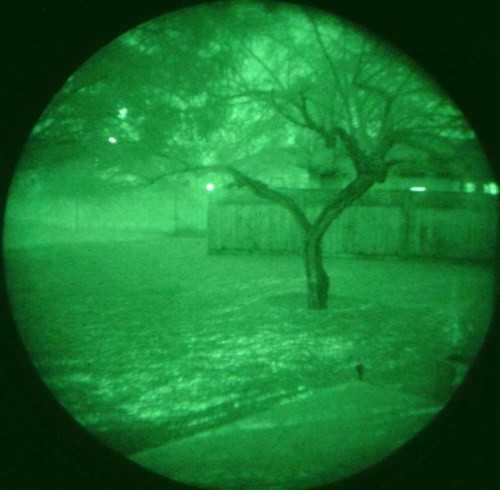 THERE’S nothing weird about someone owning a Gen 2 night vision monocular in suburban Melbourne – they might merely be a bat-watching enthusiast. Tonight we’re scanning the skies for fruit bats and skimming the grass for trapdoor spiders, the eyes of which you can see glowing up at you – so I’m told, anyway. I’m more interested in checking the windows of the neighbours, but they seem to be wise to this sort of behaviour and everyone’s got their curtains shut. Keeper? Yes, but will invent an intrepid mission next time. Apparently someone has borrowed the perfectly normal Gen 3 US Air Force headset with automatic rangefinder and IR targeting laser to go pig hunting. So I’ll wait for the return of that.